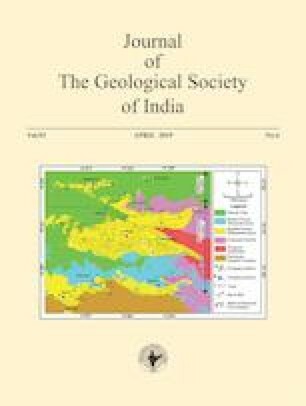 Through extensive field studies substantiated by detailed petrographic, geochemical and mineral chemistry studies, a significant event of “Proterozoic magnesian feldspathic magmatism” is reported from the SE part of the Indian subcontinent. Three major granitoids i.e. Vellaturu, Ipuru and Nakerikallu (VIN) are emplaced along an NNE-SSW axis in the Proterozoic Nallamalai fold belt (NFB) in the Eastern Dharwar craton (EDC). The axis of emplacement of VIN granites represents a tectonic contact that is juxtaposed along the NE fringes of NFB and adjoining Precambrian accretionary terrain comprising of gneisses and amphibolites with intrusive granites in the northern part of the Nellore schist belt (NSB). Petrographically the VIN granitoids are biotite ± hornblende bearing with apatite and zircon as accessory phases. Exsolution texture is observed in the form of microcline microperthite intergrowth. In IUGS, QAP diagram the VIN granitoids essentially fall in granite — granodiorite field. Presence of mafic rich microgranitoid enclaves (MMEs) are prominently noticed in the VIN granitoids indicating magma mingling. These granitoids are deformed along their margins. Enclaves of quartzite of NFB and older amphibolites indicate the intrusive nature of VIN granitoids. Major oxide analyses indicate that the Mg# ranges from 43 to 56. Rare earth element studies reveal a general enrichment of LREE relative to HREE. Incompatible HFSE element studies indicate a significant Nb and Ti negative anomaly; characteristic of subduction zone magmatism. In Y + Nb vs Rb trace element tectonic discrimination diagram the granitic rocks of Nakerikallu, Ipuru and Vellaturu essentially fall in post-collisional granites (post-COLG) field. Based on the remarkable magnesian feldspathic character coupled with their emplacement in an arc magmatic tectonic setting, it is concluded that the VIN granitoids in the Proterozoic NFB, SE India; mark a significant event of “Proterozoic magnesian feldspathic magmatism” in the EDC.